The Airbus A380 is a double-deck, wide-body, four-engine airliner manufactured by the European corporation Airbus, a subsidiary of EADS. The largest passenger airliner in the world, the A380 made its maiden flight on 27 April 2005 from Toulouse, France, and made its first commercial flight on 25 October 2007 from Singapore to Sydney with Singapore Airlines. The aircraft was known as the Airbus A3XX during much of its development phase, but later the nickname Superjumbo A380 has since become associated with it. The A380 featured at Xtreme Hobby is the largest EPO model you will ever see!, and with a wingspan of 1520mm and four 56mm High Powered Electric Ducted Fan Units, its sure to make an impression at any airfield! Look at the size of this bird!!! !, it's MASSIVE!. Despite its size, the A380 is a very light and economical aircraft to fly, only requiring a single 3000 mAh 3S battery to power its 4 motors and ESC's. Best of all we include the battery for you at no extra charge. 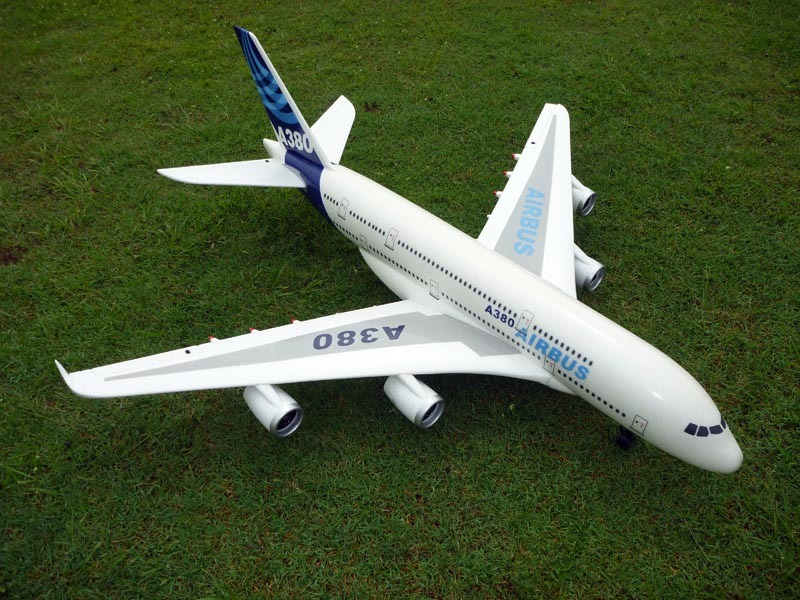 This huge A380 (EPO) model aircraft comes 95% pre-built and includes a powerful set of 4 x 25A brushless ESC's, all servos, a steerable nose wheel, and 4 over powered edf motors and fans, just include your own Tx/Rx and you are ready for flight. (Perfect for Grass Take off and Landings).